Georgette Frost did not dream her first adventure after growing up in a bookshop would be to dress as a boy to begin her search for fifty thousand royal sovereigns stolen from the Royal Mint. That is just where she found herself, though, when she encounters Lord Hugo Starling. Lord Hugo had been coming into her family’s bookshop for years and the two were no strangers to each other. Every time he found himself walking through the doors of the shop, Lord Hugo told himself he was simply checking up on Georgette’s welfare. So when Georgette comes up with the harebrained idea of Lord Hugo joining her in her quest to find the coins, Lord Hugo finds it difficult to say no. After all, Georgette still needed to be looked after and what better man to do that but him? Georgette grew up in a bookworm’s paradise, surrounded by books and people who loved them. The only problem was her parents who were so enthralled with their studies, they appeared to have forgotten they were parents. While Georgette loved books, she still had a heart-breaking hole in her heart where a parents’ love was meant to fill and a brother she had little contact with over the years. Lord Hugo appeared to be the answer to at least one part of her scheme; he can get her to her brother safely. Thus, their adventure begins. 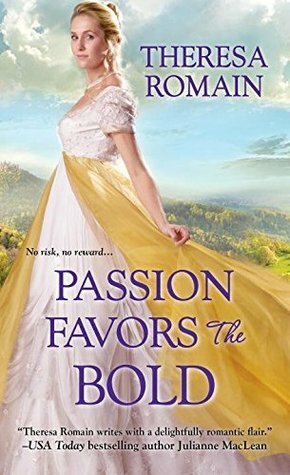 Georgette travels as Lord Hugo’s wife and the two embark on an unlikely adventure filled with intrigue, humor, and a budding passion that neither was ready for. Theresa Romain’s novel is full of wit. The banter between Georgette and Lord Hugo is highly entertaining. Georgette’s personality is quirky, funny, and is a perfect complement to Lord Hugo’s more serious nature. Their journey throughout the story was so much fun to follow, I hated to see it end. 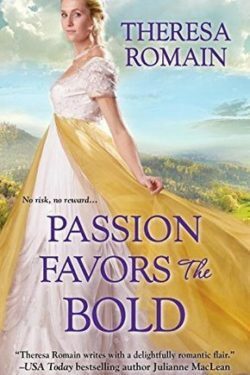 Her charming brother’s story continues in FORTUNE FAVORS THE WICKED.